Hanging on when times are tough, and relaxing a little when it isn't, is what life is all about for most people. In the Thunder Butte area, life never has been easy – at least never for very long. It wasn't easy going 150 years ago for the Lakota who used to follow the buffalo for their livelihood or for the white settlers who put claims on land in the early 1900's – land that looked good for farming one year but would blow away in dust storms the next. Things are still difficult today for the people who live in the towns, on the ranches, and among the Cheyenne River Sioux Tribe who inhabit much of the area. The land is tough to live on and the climate can be unforgiving. 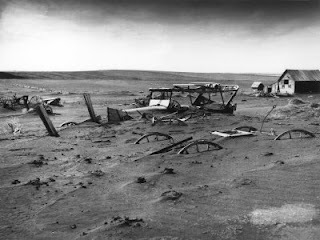 During the dust bowl years of the 1930's, a lot of people who came to farm and settle in towns packed up and moved on. The last several years has brought a drought that no doubt has caused many of those who remain to think about moving on, too. The climate can be unpredictable. At times, the wind comes blowing across the prairie, threatening to destroy everything in its path. Last July, for instance, a tornado touched down in Ziebach County, traveling a fifteen to twenty mile course that fortunately missed anyone. Winters can be particularly harsh. Blizzards like the the one in January 1949 that left houses and cars buried for up to three weeks have earned South Dakota the nickname, “The Blizzard State.” Last November's blizzard provided an apt reminder of the winter time hazards in these parts when about forty people were stranded in their cars on Highway 212 between Newell and Faith, some for up to 48 hours before rescuers could get to them. The hardships aren't just weather-related. The economics of trying to make a go of it are tough. Ranching is hard, and jobs are hard to come by. There aren't enough taxpayers around to pay for essential services. For example, the library in Bison needs a new building, but can't get funding. Timber Lake needs a new school, but can't afford one. Faith's students go to classes in temporary trailers because the old school building has been condemned. There is no money to pay for a new one. As an economy move, the State is forcing some school districts to close. Isabel's school district is closing and merging with Timber Lake's, some twenty miles away. The threat of mergers doesn't just affect schools. The National Guard Armory in Lemmon is closing — part of an economy move that will consolidate units in more populated areas. The State also is looking to merge some existing counties to save money. Ziebach County, with only about 2,600 residents, could be among those considered to no longer be viable. House Joint Resolution 1002, introduced in the State Legislature on February 3rd, proposes an amendment to the State constitution that will establish a County Consolidation Commission and give the Legislature the power to consolidate and establish new counties. The savings for the State might total about $1 million a year, which does not sound like the all the fuss is worth the trouble quite frankly. The argument is made, too, that counties would benefit by being able to spread services over a larger tax base. But, truth be told, people already drive miles for basic services in this part of the country. Forcing people to drive farther only makes life tougher. Many of the towns in the area are shrinking according to Census estimates. For example, between 1990 and 2007, Lemmon, Isabel, and Bison lost more than 25 percent of their residents. Faith and Timber Lake each lost close to 20 percent. While these are just estimates – not based on an updated census – they do underscore the fact that life is getting tougher in an area where many people are just barely hanging on.